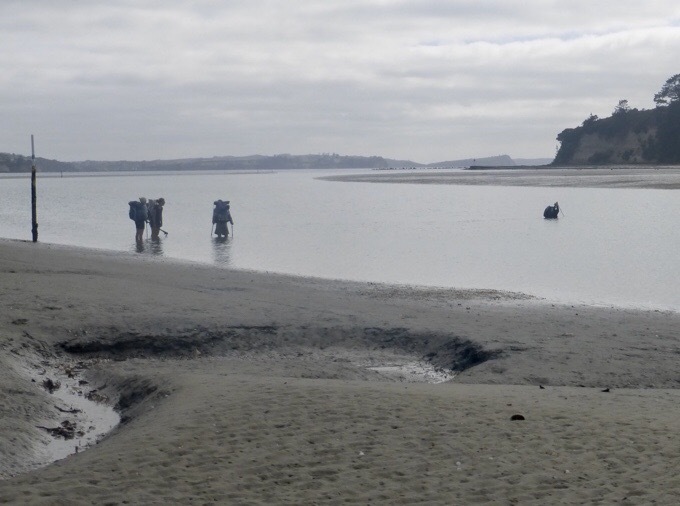 We got to have a relaxed leave time of 8:15am because we needed to time this morning’s crossing of the Okura River at low tide. There were 9 of us that hiked out from the Stillwater Holiday Park. 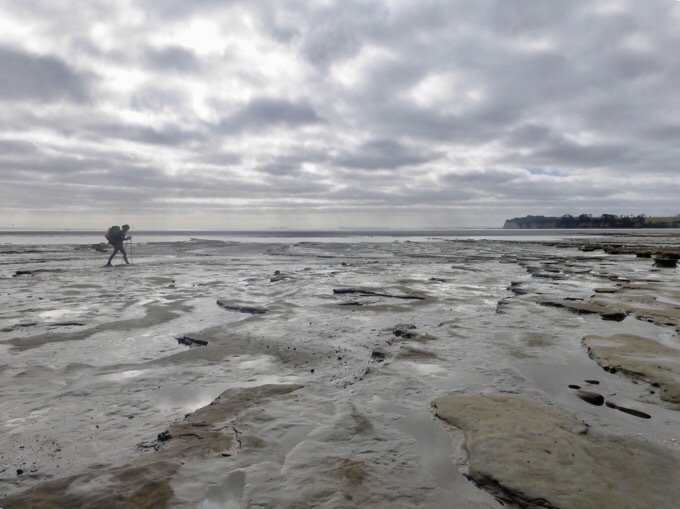 It was nice at low tide and some of my favorite photos so far with the morning clouds and slick sand bar. We surprisingly came upon six others (including Softwalker and Laurel) at the crossing when we arrived. Four were at a post where it was chest deep, and two others were upstream attempting up to their necks. Something wasn’t right because the trail notes clearly said it would be hip deep. I read more carefully and noticed that it said to go to the fourth post form the mouth and out on the spit of land that you can see in the distance in this photo. Hikers crossing too far upstream rather than the spit of land in the distance. I think this is a common mistake as I’ve seen others document that it was deeper than described. I pointed out the spit of land and the 9 of us headed to that while the others chose to stick to what they already started. 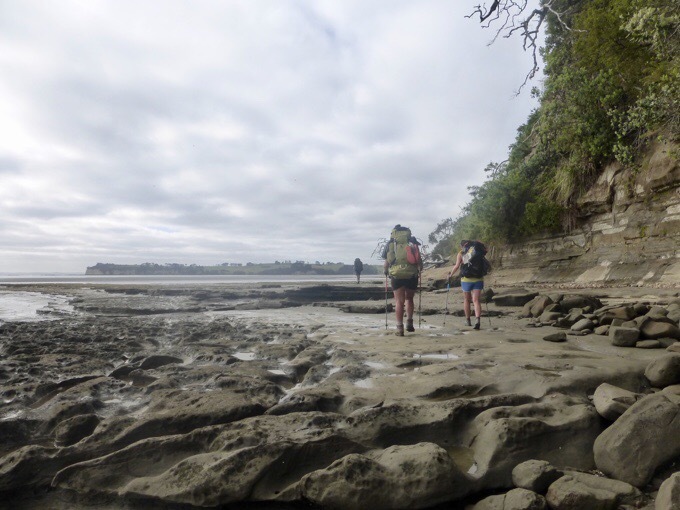 All worked in the end, but yes, the spit of land option was only hip deep and we were able to keep packs dry. 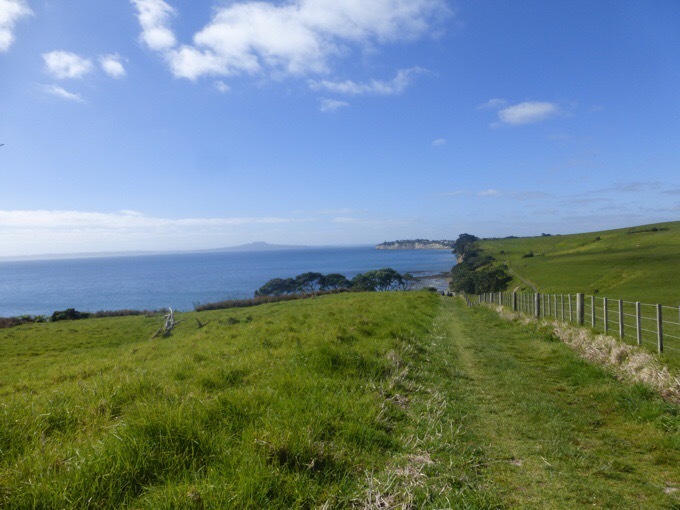 For future walkers, as you go out, arc toward the ocean a bit rather than cutting straight across form that fourth post on the spit of land. That will keep you on the sand bar where there is only a brief dip to the waist, but most is more shallow. 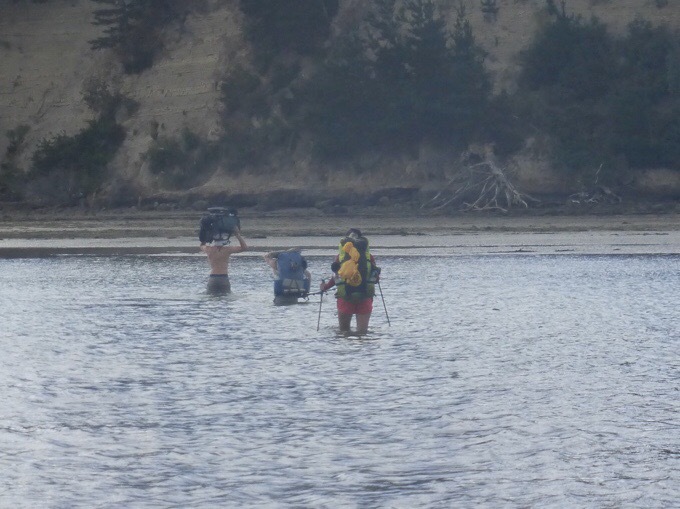 The river current wasn’t strong, so it was a straightforward crossing. 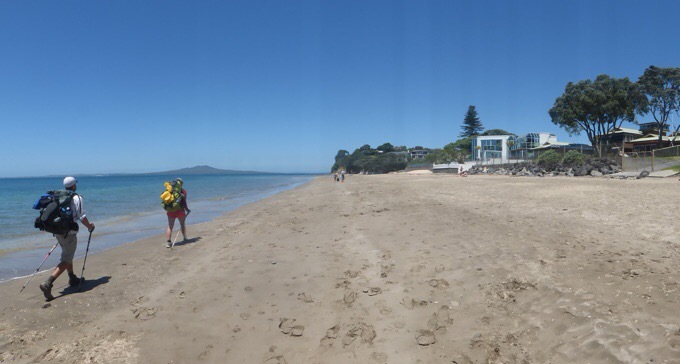 Shallower crossing at the spit of land. 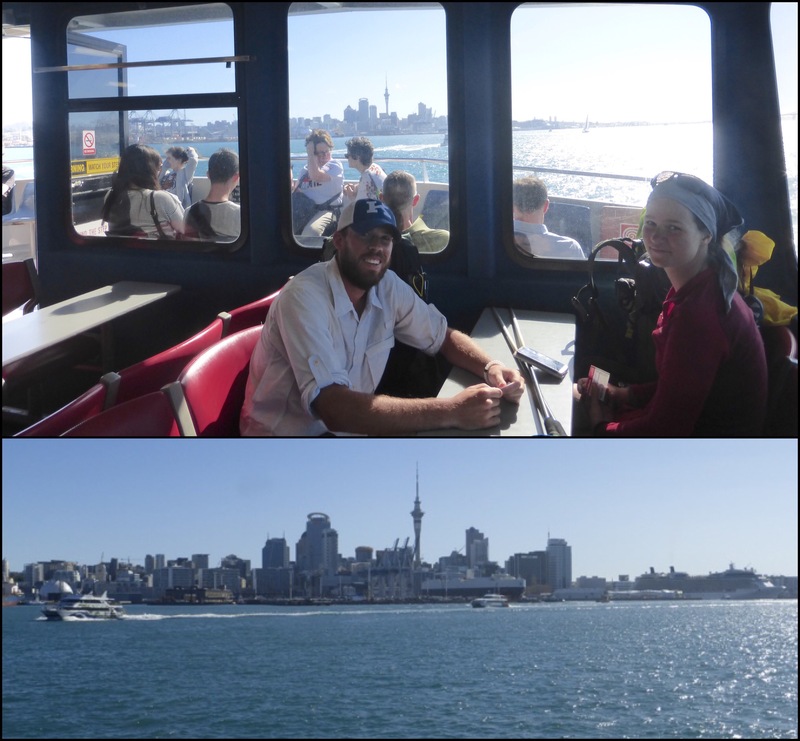 After the morning excitement, the clouds lifted, and the rest of the day was a coastline cruise to the Devonport Ferry into Auckland. There was a good variety. 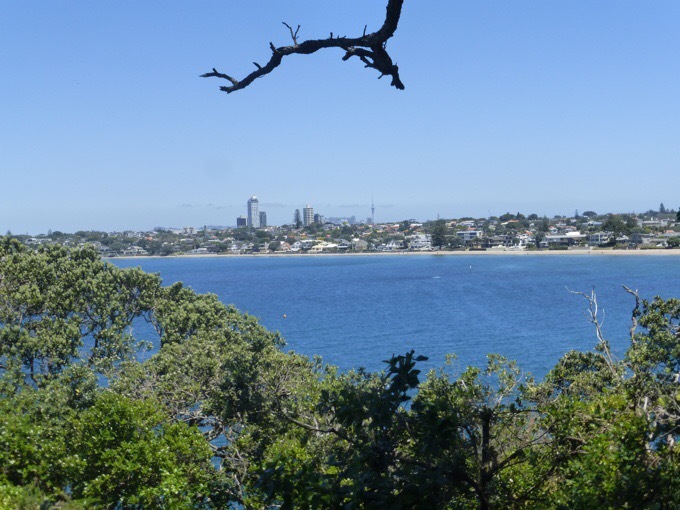 Some cliffside walking, coastal walkways, beaches, rocks, residential areas, and little suburban-type areas. 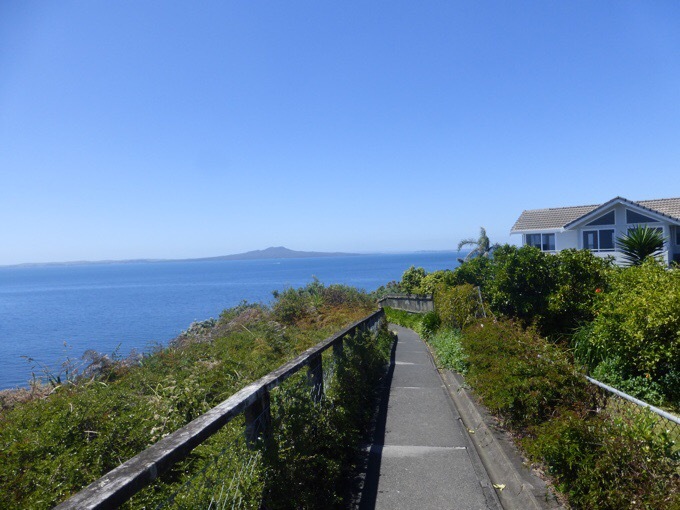 The whole day, we had a view over the ocean to Rangitoto Island, which is a volcanic island. 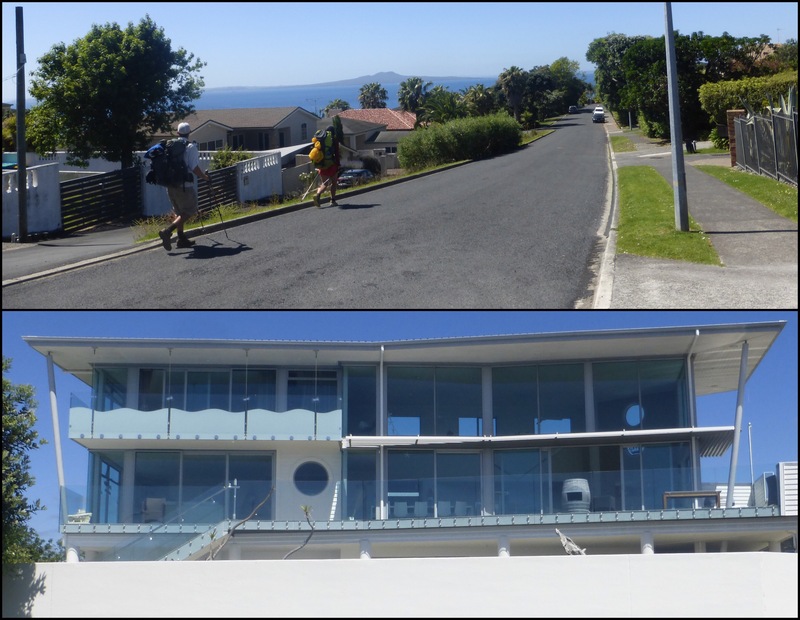 Beach walks along really nice properties and vacation homes. Nice walkways built for locals or vacationers. We saw many walking or running and enjoying a very pleasant day. I did walk with a local a brief bit and asked about this area. 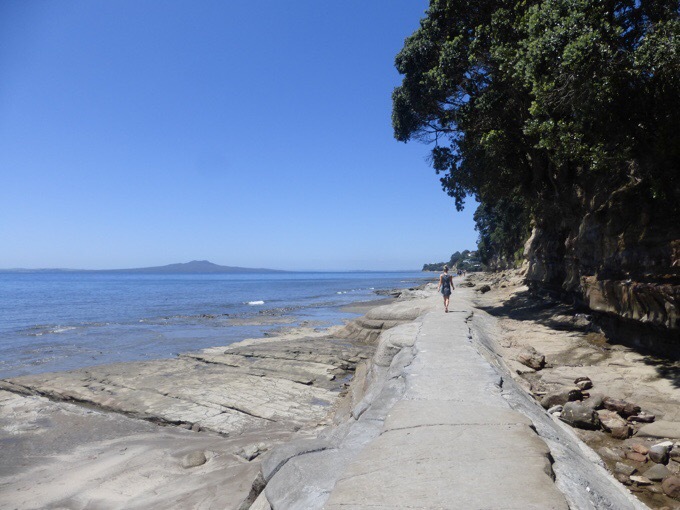 They said they do consider this to be Auckland, but that it’s not at the same time because it is much calmer and quieter. It was definitely a nice place to live and she said homes ranged around 2-4 million. It seemed like a pretty ideal spot to be that was near somewhat solitude yet also close to a major city. One of the residential areas and an example of the nice homes that all have cool glass balconies. 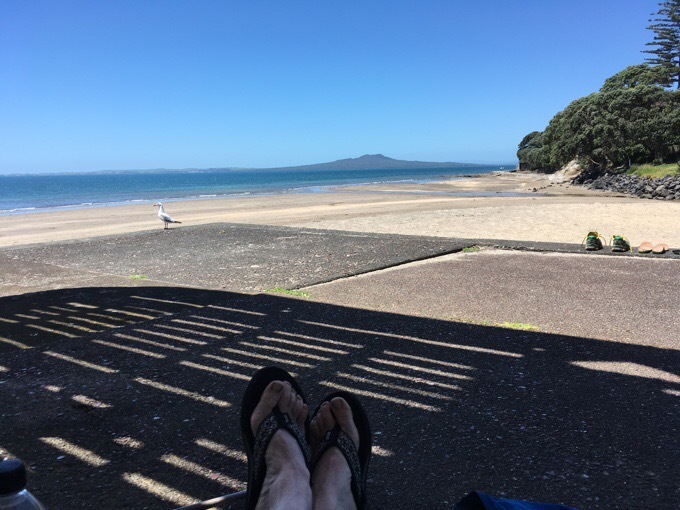 We stopped for a long lunch at one of the beaches. Will and Becky walked up the street to buy meals and I stuck to my hiking lunch of a tuna tortilla wrap. I started my period this morning, so I was not feeling 100% and welcomed time to just sit. It hit me while sitting there that it was my first real solo time in the last 12 days. There are pros and cons to hiking with others, but I’m wanting to give it a try as the pros seem to outweigh the cons at this point, but I am noticing that it tires me out more than hiking solo. I also think it’s all this commotion on the N Island that hasn’t given us much solitude time at all. I heard it will improve after Auckland and I’m greatly looking forward to that, and getting a shift to something hopefully less populated. A quiet moment to myself. A cool walkway built up higher for when the tide comes in. The first view of downtown Auckland. 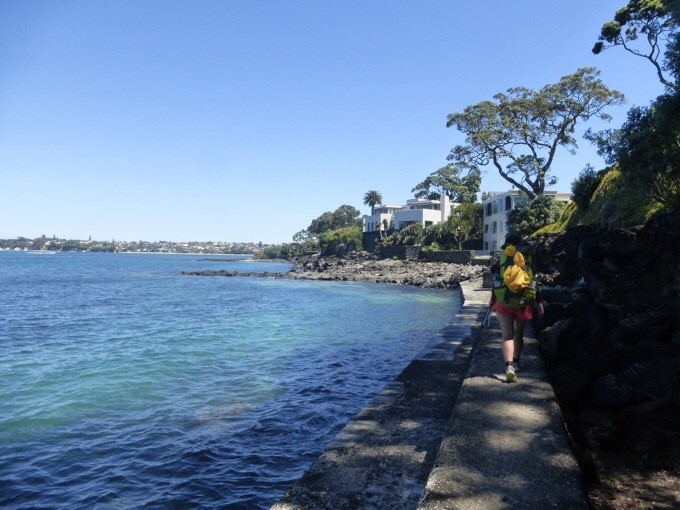 Some of the more narrow walking just before reaching the Devonport Ferry. We realized that we were on the last beach walk we think for the whole trail. Although we’ve had some crossings, we’ve yet to actually swim in the ocean. Will and I were up for it and thought it was a must do since the temps were right and the water wasn’t too cold. We reached an area with many in the water and gave it a go. Becky was happy to stay on shore. I don’t love swimming, but was ready to give it a solid effort. Will headed out ahead of me and dunked right in. When I got up to my waist, I looked down to see one of the main reasons why the ocean freaks me out…jellyfish! I yelled out to Will asking if there were jellyfish and he said yes and that he had just been stung on the ankle. With that, I was done! This photo is a good shot of will casually walking out as I was focused on dodging all the jellyfish! I’ve never had that experience of being stung and want to keep it that way. There were a lot of them out there. Later, I found out that for some reason, they are washing up in droves recently. Maybe something to do with all this high tide stuff and the super moon. Will and I attempting to get in the ocean at our last beach. 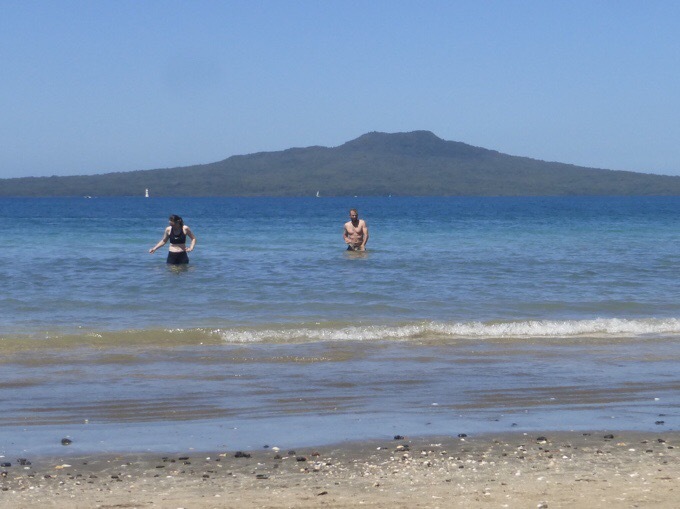 Rangitoto is behind us. 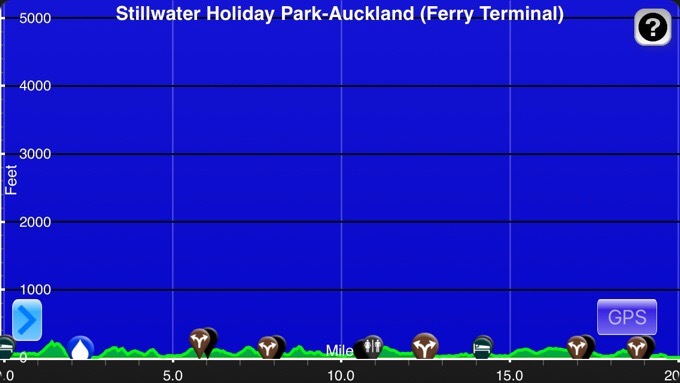 We got to Devonport Ferry in time for the 5:15pm ferry across to Auckland. This feels like a significant moment in the hike as it marks almost the 600km mark. This is day 20 for me, but since day one was only 1km in, it’s more like day 19. Tomorrow will be my first full day off and I’m looking forward to a nice relaxing zero of not walking anywhere. I’ve averaged 19mi/30km a day, which is pretty good for out here. Time to rest! The ferry into Auckland and the Auckland city skyline. When we got off the ferry, Claire (who hosted me when I was last in Auckland before the hike) was there to greet us. 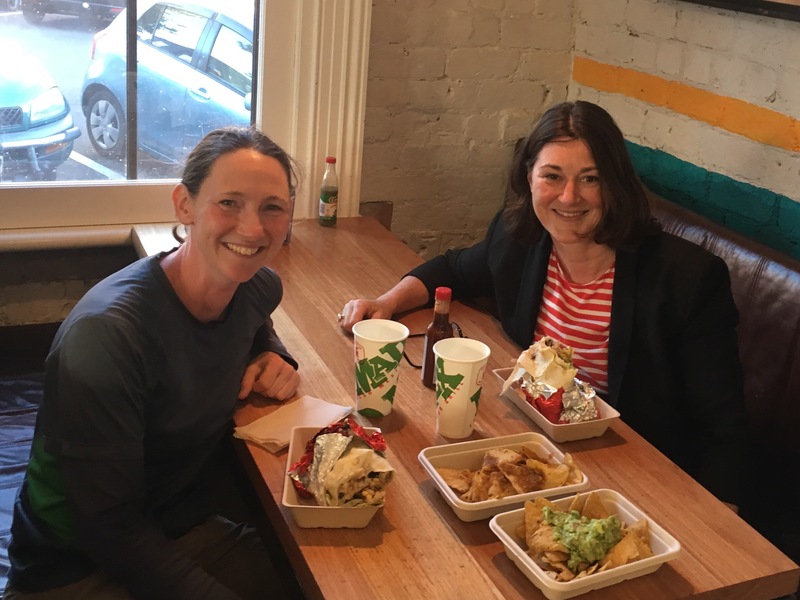 She kindly offered to take Becky and Will to their respective places (Becky with a friend, Will at an Air B&B) and then we went out to dinner for some quick Mexican food that hit the spot! THANK YOU to Claire for being such a giving host. We all were pretty drained at the end of the day and having someone there to get us all to our various locations in the city really helped a great deal! So tomorrow will be my much desired zero day. I really hope to get the time to catch up on my shows! 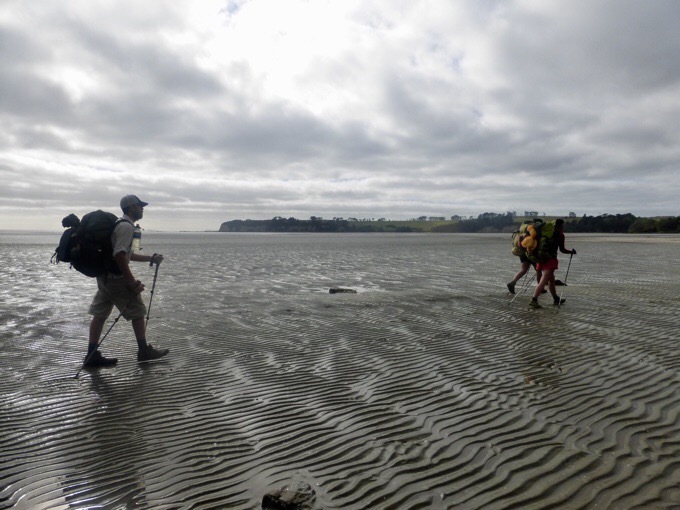 Becky and I will hike out the following day together, but Will is thinking he’s done with the Te Araroa. As I explained a couple days ago, he was here to have fun, not for the challenge of a thru-hike or the allure of hiking the length of a country. Those aspects are what keep Becky and I on this “trail,” but it is understandable that Will can imagine much better ways to spend his time and money in the year that he has to travel before returning to the US to work. Will has a working visa and is leaning towards Wellington and working there a bit before then maybe doing the South Island of the TA or just other hiking down there. Maybe he’ll pop up again down the trail, but for now this is goodbye. It was nice to have shared the last two weeks with Will and I wish him the best in his year out here! Zero day tomorrow! theres also bigger fish out there, you could see Orca just off the North Shore a couple of days ago. Enjoy your zero day – you have earned it altho you do look nice and rested in the picture!! Have a great Thanksgiving.. Yes, nice that you get a Thanksgiving Zero. Besides the moon ?, there have been the big quakes in NZ and Japan recently.. that could be a factor in behavior in the ocean. If it could be sounds under water. Nice to see Claire again, too. Claire, thanks for hosting Erin and helping with Will and Becky too. Us Americans are thankful to ya. Will, good luck in whatever you do. I hope your work will involve both fulfillment and fun. Zero, way to go Erin. Hope it was amazing for you.